The Ferrari 250 GTO is one of the world’s rarest, most desirable and most valuable cars, and this new Haynes Manual takes a look under the bonnet to reveal what makes it such an icon. The 250 GTO is one of the most sought-after cars in existence among collectors, due to its magnificent styling, impressive track record and rarity. This latest title in the Haynes Manuals classic racing car series — Ferrari 250 GTO Owner’s Workshop Manual, by Glen Smale — offers a unique insight into owning, racing and maintaining this iconic sports racer. Ferrari designed the 250 GTO purely for racing success, and its impressive 3.0-litre V12 engine, fine handling and robust construction helped it to dominate the GT category of sports car racing from 1962 to 1964 in events such as the Tour de France, Targa Florio and Le Mans, taking Ferrari to a hat-trick of GT Manufacturers’ titles. Ferrari only built 39 examples of the 250 GTO, and this rarity helps to explain the price tag, with a 250 GTO selling in 2013 for $52 million in a private transaction — a record for any car. The Manual charts the design, development, evolution and racing achievements of the 250 GTO in detail, with insightful first-hand accounts from several of the men who drove and ran them, including drivers Sir Stirling Moss, John Surtess OBE and ‘Gentleman Jack’ Sears. 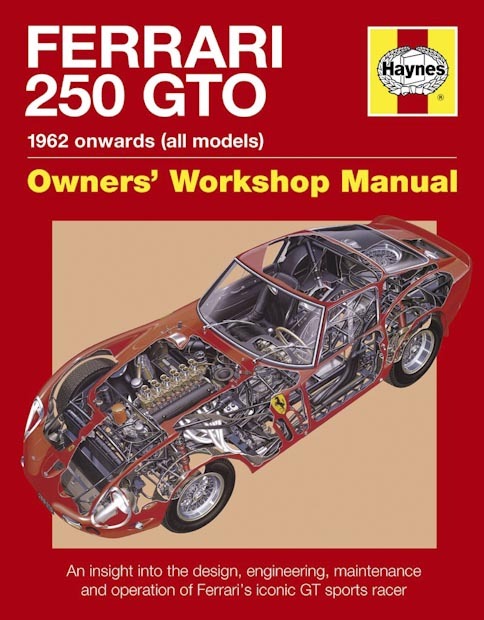 The principle subject car used for this book is the well know 250 GTO owned by Nick Mason. This in-depth study, illustrated with numerous period and modern-day photographs, provides a fascinating insight into what makes the 250 GTO one of the rarest and most revered cars of all time. Glen Smale is a life-long motoring enthusiast whose writing has been featured in many motoring and motorsport magazines. He has been a professional freelance writer and photographer since 1994. He was the recipient of the 2007 Guild of Motoring Writers’ Laurin & Klement award for writing on vehicle design.